﻿ The Butterfly Place - Westford, Massachusetts: An indoor garden filled with hundreds of freely-flying butterflies! The Butterfly Place is a Seasonal Business. Please carefully read our operating schedule, below. 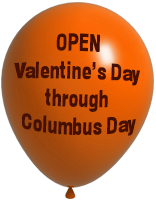 Open Seven Days a Week from February 14th (Valentine’s Day) through Columbus Day (early October). Closed Easter Sunday and July 4th. Entrance ticket sales end at 3:30 PM, and new customers will not be admitted into the exhibits after 3:30 PM. Check our Facebook page for last-minute updates. To really enjoy our butterflies, plan to spend at least an hour. Remember, you may order online 365 days a year! See our Special Offers page for discounts that may be available to you. Children under 3 MUST be in strollers, backpacks, carried or held by the hand. Group rate ($6.00 per person) is available BY RESERVATION ONLY - MINIMUM OF 15. Call as far in advance as possible.